Newbury's loss - Allston's gain? Would business owners who can't afford high rents in their existing locations be willing to consider relocating to Western Ave? Obviously the foot traffic and cachet isn't comparable, but a Western Ave storefront would be highly visible to the thousands who drive through Allston and ample parking is available. If the rent was thousands of dollars a month less, would anyone try this? Wouldn't it be great if Harvard were actively trying to recruit some of these businesses to its many vacant buildings in Allston and Brighton? 576-576A Washington Street: Change the legal occupancy from retail stores and three apartments to a martial arts studio and three apartments. The BRA Board will vote tomorrow on the Boston College Master Plan. The room will be packed and, if nothing else, it will be quite a spectacle. The show starts at 2:00 in City Hall room 900. On this subject, Ram Rao and Abigail Furey get into the Thursday Globe with this op-ed explaining why they think the BRA should reject BC's Master Plan. And if you are wondering what BC is proposing, don't go to the the BRA website unless you want to read some comment letters. Instead you can try the website of VHB, one of BC's consultants on the project. I'm at the Jackson Mann school this morning to register my daughter for kindergarten in the Boston Public Schools. So far we have been waiting at least one hour, even after having taken the time to pre-register on the BPS website and there is nothing complicated or unusual about our application. I don't know exactly how long we have been here because the clock in the Jackson Mann auditorium is frozen at 7:45. For some reason they require a utility bill as one of 3 proofs of residence, but they don't accept a water bill. How a phone or cable TV bill is more trustworthy I have no idea. "I go to Allston a lot and yes, it's awful. People are right to complain. It's like Boston has forgotten that part of the city." 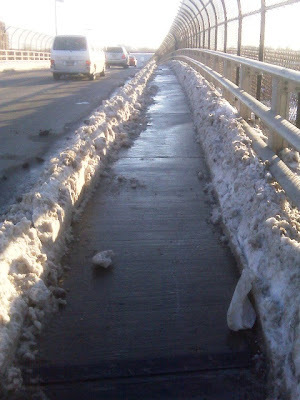 "I live in Allston, and before the snow storms, I used to walk over the pictured bridge daily to go to the Allston Public Library.Unfortunately, the snow was never cleared from the sidewalks, and turned to ice. I was afraid I'd slip and fall in the street, so I haven't tried walking the route in a few weeks." "Everett Street is a joy compared to Market Street/Leo Birmingham Parkway, which has no side shoveled or plowed. Allston feels like the ugly step child of Boston this winter. Shame on the city." I thought the Pike was trying to encourage people to use Fast Lane. "Board members said today they would consider next month an alternative plan that would raise tolls by 25 cents at the Allston-Brighton and Weston booths and $2 at the Sumner and Ted Williams tunnels. In other action, the board approved a plan unveiled Wednesday to impose a monthly fee of 50 cents on all Fast Lane transponder users while at the same time offering new and replacement transponders for free. The transponders previously cost drivers $25.95." Is the Mass Pike killing us? We know how the tolls affect our wallets. How do the traffic emissions affect our hearts? 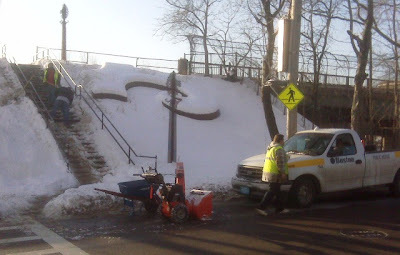 The Everett Street overpass sidewalk (on one side) was cleared of snow on Tuesday or Wednesday, and the City has several workers on Lincoln Street this morning clearing snow, four days after the last snow fell. According to the City's regulations, "sidewalks should be passable within three hours after a snowstorm." Alex Beam writes today about A/B university expansion and this recently published report from H.U. "What was that ridiculous Harvard study claiming that the World's Greatest University pumps $5 billion into the local economy all about? Dodging taxes, mainly. "We all release those studies just before we are about to launch a major expansion," an executive at another local university explained to me. "If it looks as if you have money to build, then Boston and Cambridge figure they can raise your PILOT - 'payments in lieu of taxes' - payments when you ask for the building permits." As the Globe reported, Mayor Menino and the City Council have been yapping about squeezing more money out of the city's nonprofits, meaning the universities and hospitals. But that's all moot now. Boston University, MIT, Northeastern University, Children's Hospital, and others have announced cutbacks on new projects. "We have the money to finish what we've started," my man says, "but all the big projects - Boston College in Brighton, Harvard in Allston - are going to be stalled. We can't raise money on favorable terms. The Harvard study was a preemptive shot fired in a war that's over, for now."" You'd never know from the photo, but there is a sidewalk under all that snow on the Everett Street overpass that crosses the Mass Pike. Walking around Allston today with 3 kids was not particularly fun because the City and many private property owners did little or nothing to remove snow from the sidewalks adjacent to their property. The person who answered the phone at the Mayor's Hotline (617-635-4500) politely took my request to have this sidewalk cleared. Hopefully it will happen before someone walking in the street gets hurt. The city may have fancy new cameras to snap photos of unshoveled sidewalks, but I didn't see much evidence of stricter enforcement today. 1320 Soldiers Field Road. The proposed tenant, Shin Nippon Biomedical Laboratories presentation of the proposed office and lab space uses requiring a Conditional Use Permit. 459-451 Western Avenue and 1360 Soldiers Field Road. Presentation by Mahoney’s Garden Center of proposed expansion plans. The expansion will require Greenbelt Protection Overlay District review. Readings by Christine, 183 Harvard Ave. Allston, proposal for Fortune Teller's License to be exercised on the premises. Architectural beauty - more than "green"
The Globe's architecture critic Robert Campbell writes today about the The Genzyme Center winning the Parker Medal as the "the most beautiful piece of architecture, building, monument or structure within the limits of the City of Boston or the Metropolitan Parks District." In Allston we know Stefan Behnisch, the architect of The Genzyme Center, as the architect of Harvard's Science Complex under construction on Western Ave. And like the Genzyme building, I am sure that Harvard's buildings will be lovely on the inside, with features that save energy and create a beautiful working environment. From a distance, some people may consider the Genzyme building to be beautiful in a modern sort of way. But I think a crucial consideration when judging a building's aesthetic must be how the building appears to the pedestrian who walks past the building, up close and from the outside. I took a walk around the Genzyme building in the summer of 2007 to try to get a sense of what Behnisch might offer to the Allston public realm. Unfortunately, the building up close isn't much to look at. You can walk around the building using Google Maps or look at these photos from my visit and see that street-level windows are covered with boring white shades and the interesting architecture elsewhere in the building is nowhere to be found. This might well be the "greenest" building in Boston, but I don't see how the person who walks past it could ever think it beautiful. What is coming to Western Ave seems likely to be from the same mold. If you like vegetables and locally grown food, consider purchasing a CSA share for the summer of 2009 from Dragonfly Farms. Summer sure feels a long way away, but purchasing a share now provides the farm with financial stability for the upcoming season and gets you in the queue for a lot of yummy and healthy stuff later this year. A full share costs $475 ($25/week) and a half share costs $270 for approximately 19 weeks of vegetables. After joining, you can pick up your box of veggies each week at the Allston Farmers Market (which is moving to Fridays). The Dragonfly Farms website describes what you can expect throughout the summer. In the spirit of trying new and different healthy foods, I'm looking forward to trying some things I've never cooked before and that I always pass over in favor of more familiar foods. I don't know if my kids will enjoy garlic scapes but I'm willing to give them a try! Mahoney's Garden Center, which I think is one of the best things happening on Western Ave, will be at the Allston Civic Association meeting next Wednesday to present their plans for the bigger and better garden center they want to create by expanding at their current location. I think we are lucky to have Mahoney's in our community and I hope we will do everything we can to support their success in our community. "Britain’s government on Thursday said it approved contentious plans to allow the construction of a third runway for London’s Heathrow Airport." Naturally, Sipson, dotted as it is with “No Third Runway” signs, opposes the plans. But the village, already weakened by the exodus of longtime residents worried about the future, has become the symbol of an anti-expansion campaign that goes far beyond its borders." Imagine Western Ave several years from now. What could it be? A possibility envisioned by Chris Gabrieli is a busy and thriving business area symbiotically cooperating with Harvard's new campus with a variety of "hot new companies solving medical, environmental, and other challenges by turning great ideas into great products and companies." Thousands of miles from Allston, the Inland Empire Center for Entrepreneurship could be a model for what could happen in Allston. The "inland empire" is the San Bernardino and Riverside counties east of Los Angeles, and a story in the NY Times yesterday describes the success happening there as a result of "the concerted support for small enterprises and start-up companies from the area’s universities and nonprofit organizations." There already is a Center for Entrepreneurship in Allston and if it were interested in doing a bit of local thinking maybe some great businesses could be getting started sooner rather than later along Western Ave.
Comm Ave bike lane only for the advanced? Looking more at the Boston Bike Map, I was amazed to see that Commonwealth Ave between the BU Bridge and Kenmore Square, home to Boston's first major bike lane, is rated as suitable only for "advanced" cyclists. Is this a mistake on the map? Does City Hall think this bike lane is a failure? Because if a bike lane on a straight road with relatively few intersections can't make the road useful for at least intermediate riders, it is hard to imagine how Boston will become the "biking city for all other biking cities to emulate". The City is compiling information about biking around Boston. The Boston Bikes map is a compilation of what the City has heard are the best (and worst) biking roads in the city. You can send your comments to the city using this survey. Apparently you have to be an "advanced" cyclist to get much of anywhere in Allston and Brighton. I'm surprised to see Market St, Lincoln St, and North Harvard St in the middle tier of roads because of their steep grade, narrowness, and abysmal road conditions, respectively. Unfortunately the map file is 14MB and I had to try a few times to download it from the City's website. You can see all of the A/B info by clicking on the image to the right. Mechanics at Arcand Springs determined this morning that Ladder 14, which is headquartered in Allston, has "linkage problems" that require immediate repair, city officials said. Ladder 14 is a 1992 E-One truck with a 110-foot ladder and four-door cab, the same type and make as the truck involved in Friday's crash. This news from The Phoenix could be good for Allston and Brighton. This story in today's Globe describes this letter from the DCR about improvements planned for later this year along the Eliot Bridge and the River St/Western Ave area. A meeting Wednesday at 6:00 at the Copley Square Library will provide more info about these projects and larger bridge projects already underway. To improve conditions at the Pike's Newton exit 17, the Boston Metropolitan Planning Organization is proposing the construction of a new Pike off-ramp in Brighton at the intersection of North Beacon St and Soldiers Field Road. The new ramp would keep 850 people away from Newton Corner during rush hour in the morning and 300 away in the evening. 90 Antwerp Street in Allston, known as the Brookline Machine building, is finally Harvard University property. The 7/10ths of an acre property, assessed for $1,714,500 was sold by its former owner to Harvard on December 16, 2008. As with many of Harvard's previous purchases, they created a short-lived holding company to purchase the property. This time they named it Crown Mechanic LLC, created it on 12/11/08, and merged it into Harvard Real Estate Allston Inc. on 12/26/08. Harvard may be facing a hiring freeze and thriftier holiday parties, but money to buy up more of Allston continues to flow. This property is particularly interesting because it abuts the Brighton Mills Shopping Center and where Harvard would like to see the new Charlesview Apartments built. It seems probably that it will be used to expand the Charlesview site which would be a good thing if it leads to a more diverse, mixed-income neighborhood. Hopefully it doesn't turn into another blight like Harvard's CITGO station. John Harwood - CNBC : We learned during the 1960s that the best and the brightest don't always have it figured out right. President-elect Barack Obama: You've got to watch out for those Harvard guys. They'll get you every time. The Citizens Advisory Committee reviewing the environmental impacts of Harvard's expansion is meeting tonight at the Honan Library from 6-8 to discuss transportation issues relating to Harvard's plans. 15 Ashford Street - Parking Lot Forbidden, Open Space Insufficient. Increase parking from three vehicles to six vehicles. "Boston College thinks twice about forcing an unwelcome dormitory expansion plan into residential Brighton; Harvard continues close dialogue with community leaders as it builds its life sciences campus in Allston"
But what "close dialogue" could the Globe possibly think Harvard is having with anyone in Allston? Harvard refuses to talk about Charlesview. The master plan consultants that Harvard hired several months ago have given only one public presentation. Harvard's planners have sat quietly through several North Allston/North Brighton Community Wide Plan meetings during recent months. "In dialogue, there is the free and creative exploration of complex and subtle issues, a deep "listening" to one another and suspending of one's own views." Certainly it would be wonderful if Harvard were willing to do anything like this with anyone in Allston, but based on what transpired in 2008 the Globe is giving Harvard way too much credit.